From a young age, I have liked waffles. As a kid, that meant Eggos. 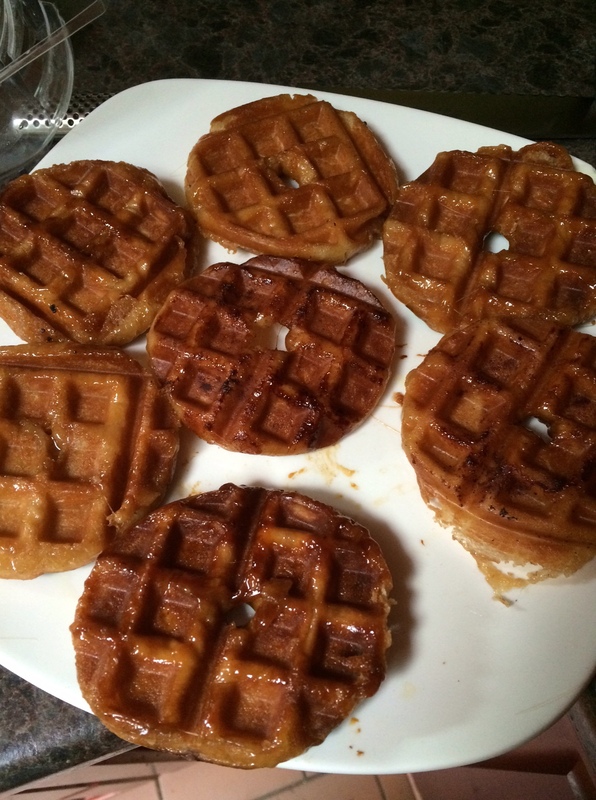 As an adult, I still like Eggos (despite knowing there is little redeeming health value from them). But I also like fancy pancakes – not just your standard Belgian, but specifically the yeasted waffle with pearl sugar coming from Liege, Belgium. It’s probably a good thing that as my husband and I head out this fall on a long overdue honeymoon, one of our stops is Belgium. For our anniversary, he got to go to Haines for a beer festival and he got me a fancy professional waffle maker. But did you know batter is not the only thing you can put in a waffle maker? 5. Leftover noodles or rice with some egg as a binding agent – This doesn’t work particularly well, but I think it’s just that I haven’t worked out my ratios. 4. Okonomiyaki – This is a Japanese pancake made with cabbage and seafood. It worked, with most of its structural integrity intact, but I think I prefer the uniform cooking of a pan. 3. Grilled Cheese – This works really well. It manages to make pockets of gooey cheese, interspersed with crunchy fried cheese. 2. Stuffing waffle – This is probably my favourite, however it’s not every day that you have leftover stuffing. You can add other leftover Turkey dinner items – mashed potatoes, pulled apart turkey, gravy. Just note that the more things you add, the less likely the whole concoction holds together. Serve with gravy and cranberry sauce. It manages to get a crispy stuffing exterior with a fluffy interior. It’s heaven. 1. Glazed donuts – I had seen something about doughnut (yes, I spell it both ways, interchangeably) waffles on pinterest and it stuck with me. So I went to The Independent, thinking of grabbing a couple from the bulk bakery section. Alas, there were none. 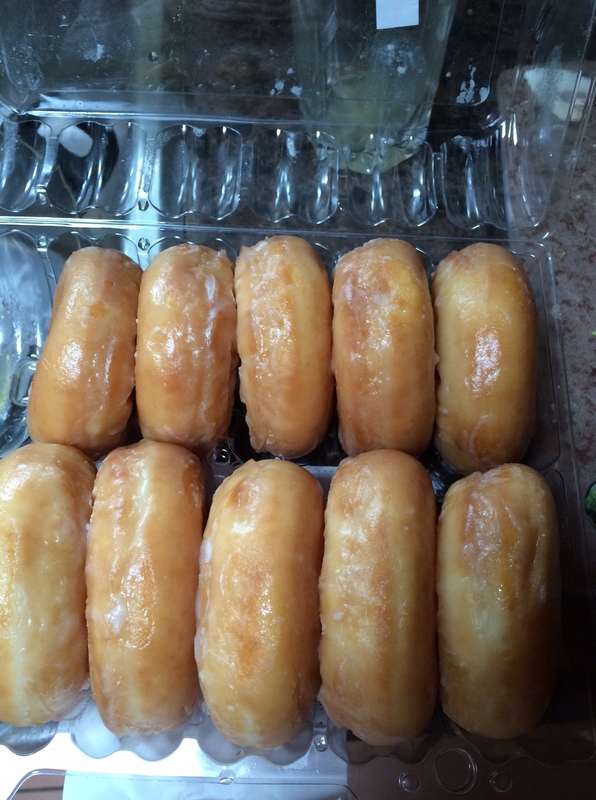 So I ended up with a dozen(!!!). Just stick them in the maker and press down. They give off a lot of grease and sugar, so the first ones are better than the later ones, as the excess caramel starts to burn in the press. But those first few are really good. Sprinkle some cinnamon on them, if you want. My mom and I ate quite a few and I froze the rest. Still haven’t tried them out of the freezer. A bit sticky in your teeth. Posted in DIY, Recipe and tagged At Home, Breakfast, Doughnuts, Grilled Cheese, Leftovers, Thanksgiving, Waffles. Bookmark the permalink.